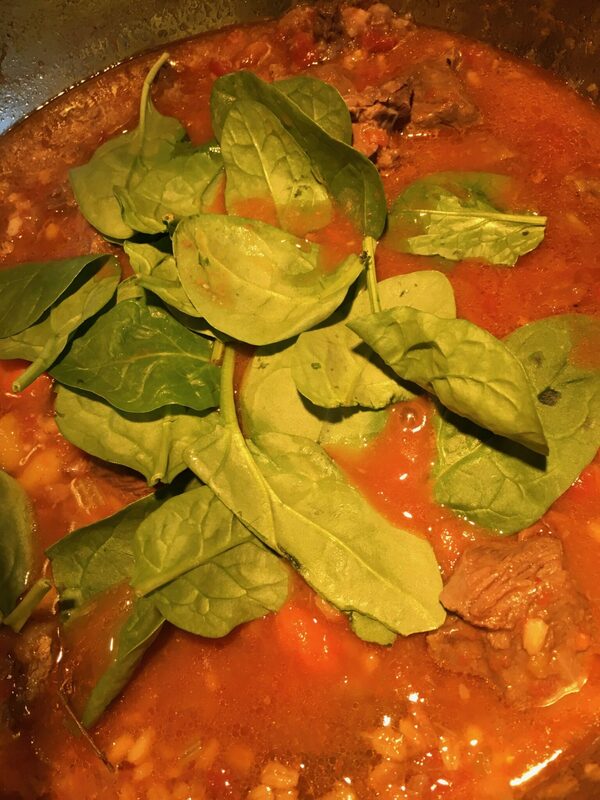 If you love soup, this beef barley soup with spinach is really tasty and easy to make. It’s a hearty soup which will serve 8 or more and perfect for a family or guests. There’s something really comforting about beef and vegetables simmered slowly for a long time. Adding barley and spinach makes it a wonderful and nutritious one-pot meal. The perfect cut of beef for this recipe is chuck or rump roast. Choose a 2 1/2 – 3 pound piece of beef and cut it into one-inch bite size pieces. I like to add a few beef neck bones just to flavor the broth. Other flavorings come from fresh vegetables like onion, carrots, and celery. The vegetables are mixed in with the beef and water in a big pot. Then I throw in a few sprigs of fresh thyme and bay leaf. After it has boiled and slowly simmered for one hour, I mix in the tomatoes, salt and pepper. At the last 30 minutes of cooking I stir the barley in to let it tenderize but still have a chewy bite like pasta. At this time, you can adjust the seasoning with salt and freshly ground pepper according to you taste. Spinach is added at the last two minutes of cooking just to let it start to wilt. After the soup cooks, the meat is so tender and delicious! You can serve this soup with a side of crusty bread or mixed green salad. If you are entertaining, you can preboil the beef one day before or hours before your guests arrive and add the barley and spinach later. Make sure not to add barley in advance because it will soak up all the broth. As you can see, most of the cooking time is passive and you can do other things while the soup is slowly simmering. Passive Time 1 hour, 50 mins. 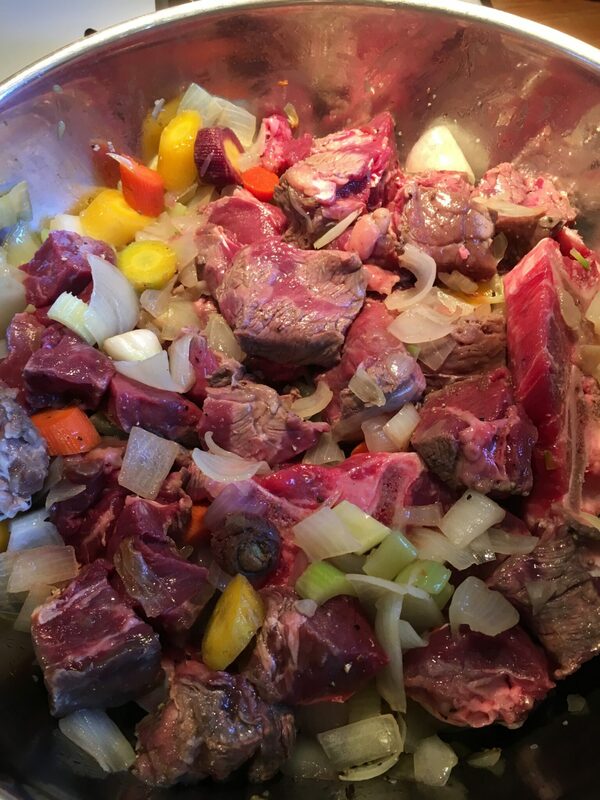 Place beef, neck bones in a big pot. Add onions, celery, carrots, water, thyme, and bay leaf. Cover the pot and let boil on high heat. After it starts boiling, turn down the heat to low/medium and let it simmer for 1 hour. Keep an eye on it as it starts to boil. Skim the foam off the top. Process the canned tomatoes in a blender or processor. Stir the tomatoes into the pot. Season with salt and freshly round pepper to taste and continue to simmer for another 25 minutes. Add barley into the pot. Mix it in and let cook for another 30 minutes. Adjust the seasoning to your taste. Discard the bones from beef neck bones. Add spinach into the pot and let it wilt for 1 minute. Serve in a bowl.